TheTheaterPractice’s latest drama – “The Bride Always Knock Twice” is here! The story is about 8 women from different generations and background, disappeared from the world they originated from, and gathered in a mystery place. The Artistic Director – Ms. Kuo Jian Hong, is presenting the light-hearted comedy in an easily comprehensible approach, to be hugely accessible to the audience. A door that’s never locked. Occupied by women from different generations and backgrounds – and their secrets. A runaway bride abruptly invades this space, kicking off a series of suspenseful moments, frolic, disputes and warmth. Don’t you envy me? 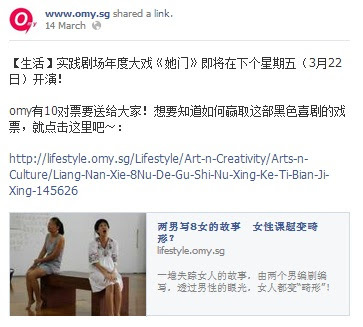 I won the pair of tickets to the performance through omy.sg! I still remembered the last time I watch a drama, which is also performed by the TheTheaterPractice’s with sister – how time flies! Especially love the scenes: How many women does it take to change a light bulb and iPad. Love the witty dialogue in the performance, can’t help but feeling that they’re so full of wisdom and thought-provoking even though I can’t stop laughing. This is a multi-lingual performance with English and Chinese subtitles.